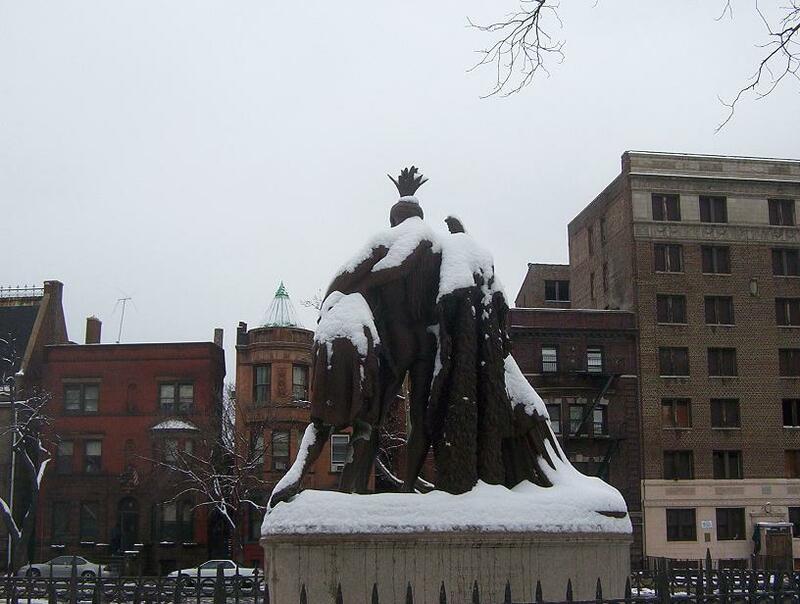 From the erection of the Seth Boyden statue in 1890 and through the first three decades of the Twentieth century, Newarkers regularly beautified their parks with statues and other memorials. Washington Park, Military Park, and Lincoln Park received the greatest number of statues, and each became almost an outdoor sculpture museum. 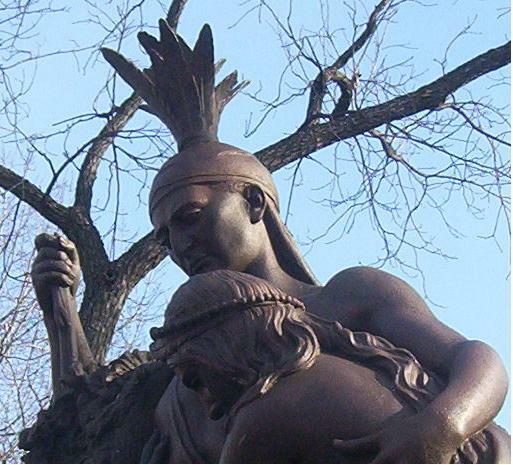 In this feature we are going to explore one of the two statues in Lincoln Park, "An Historical Incident of November, 1764." Planting the Standard of Democracy is profiled in an accompanying webpage. At 12:30 Thanksgiving Day on 1895 Lincoln Park was packed with thousands of Newarkers gathered to witness the unveiling of the newest addition to Newark's growing collection of public sculpture. With a flourish, a large American flag was pulled off the sculptural group depicting a white woman choosing between her mother and her Indian husband. After speeches by the donor, the son of the very famous Abraham Coles, and Mayor Lebkeucher, the granddaughter of the Newark chief of police threw the keys to the gate surrounding the statue into the Passaic River for "safekeeping." 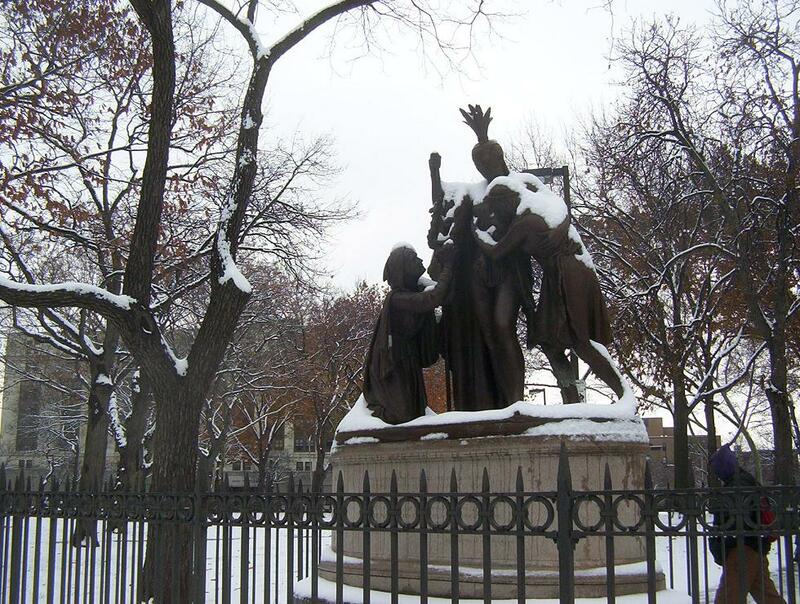 The official name of this statue on the Clinton Avenue side of Lincoln Park is "An Historical Incident of November, 1764" but some newspapers of the time referred to it as "Captive's Choice," a more elegant title in this writer's opinion. Captive's Choice was made in 1884 by Chauncey Ives, an American sculptor living in Rome, Italy. Ives was born in Hamden, Connecticut in 1810, studied as a woodcarver, and went to Florence for more advanced artistic training in the 1840s. In the third quarter of the Nineteenth century, Ives and Hiram Powers were the two foremost American sculptors working in Italy. 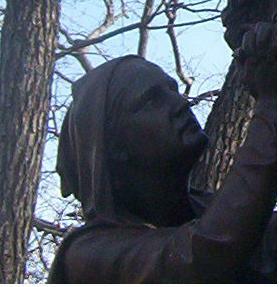 Ives in particular earned a reputation for sculpting children and depicting naked bodies. Connecticut's two contributions to Statuary Hall in the Capital Building, Roger Sherman and Jonathan Trumbull, are by Ives. The historical background of "An Historical Incident of November, 1764" is the seige of Fort Pitt during the French and Indian War. When Colonel Henry Bouquet defeated the Indians at the Battle of Bushy Run the Indians gave up a large number of white captives. Some of whom had lived with the Indians for such a long time that they could hardly be considered involuntary captives any longer. According to the legend, there was one white woman who did not want to return to the English. This woman had been abducted in childhood and was now the wife of an Indian chief. Not until her mother sings a song from her youth does the woman remember where she came from. At the end of the song the wife must make the impossible choice between her mother and her husband. 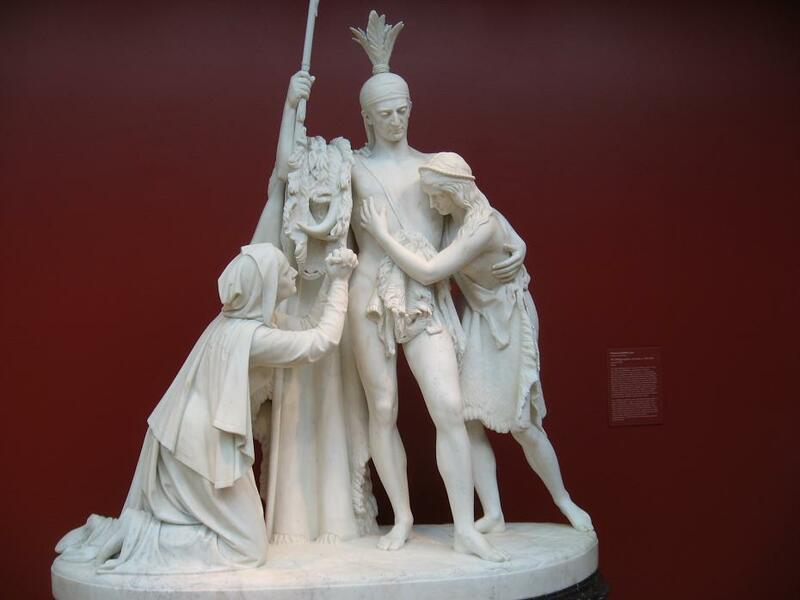 In the sculptural group, the fully clothed mother is at left, the stoic Indian husband at center, and the female abductee at right. For an incident that allegedly took place in November, the Indian and his wife are strangely underdressed. The Newark Captive's Choice is not the only version Ives ever made. Ives made at least one marble version, today seen in the Chrysler Museum in Norfolk, Virginia. Abraham Coles is scarcely remembered today, but he had some fame for his poetry back in the Nineteenth century. 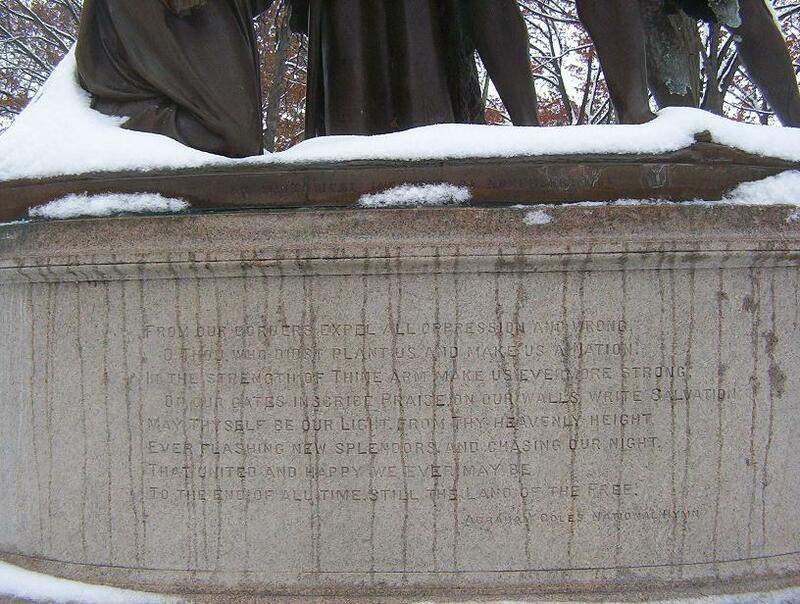 The sides of the pedestal are inscribed with excerpts from Coles' "National Hymn," - "Columbia, Land of the Free," and "My Native Land," - a fitting message for a patriotic monument. The son, Ackerman Coles, donated sculptures and busts to places as far from Newark as Harvard University. 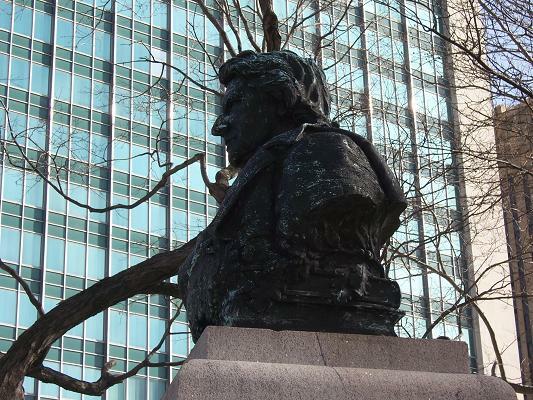 Ackerman Coles' other Newark donation is a bust of his father in Washington Park. Special Thanks to DD for the camera.